Squirrels will eat just about anything, but they primarily eat nuts, seeds, fruits, fungi, vegetables, grains, and plants (with a heavy emphasis on nuts and seeds). First off, what are squirrels? Squirrels are rodents which are mammals from the order Rodentia. This order is the largest order of mammals (warm-blooded animals with backbones that have hair or fur and whose females produce milk) and includes mice, rats, hamsters, prairie dogs, beavers, woodchucks, chipmunks, and porcupines. Fun Fact: A group of squirrels is called a scurry or a dray. Squirrels are characterized by their small furry bodies, big bushy tails, and long sharp incisors. They can vary in size from less than 1 ounce to over 3.3 pounds in the case of Ratufa bicolour (that’s a crazy size difference!). Technically the Alpine Marmot is the heaviest squirrel weigh in at up to 18 pounds, but they don’t look very squirrel like. And, depending on the species, they can live anywhere from 5-10 years in the wild, and 10-20 years in captivity. While there are many varieties of squirrels, the three most commonly recognized types of squirrels are tree squirrels, ground squirrels, and flying squirrels. Squirrels are omnivores (meaning they eat both plants and meat). However, they primarily eat plants. 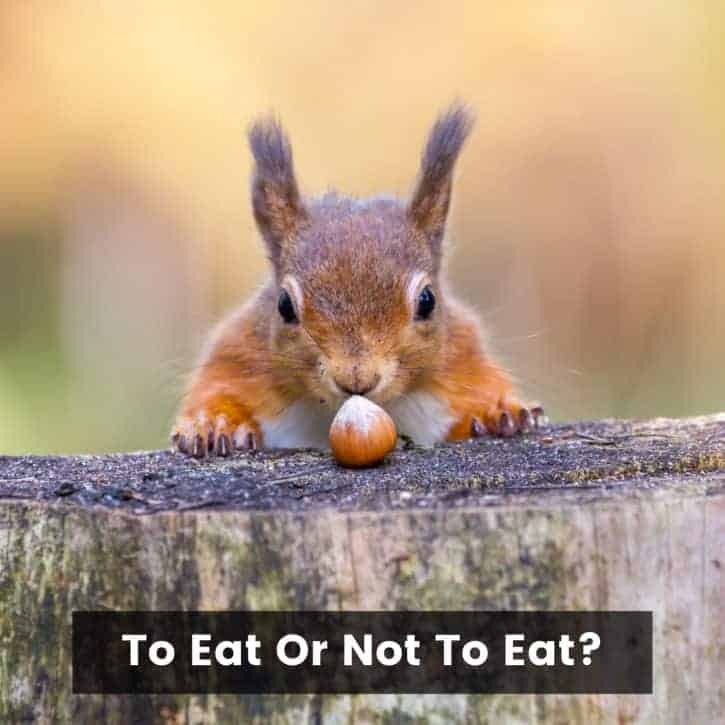 When squirrels do include meat in their diet (typically insects, eggs, or baby birds), this is often done only if they are incredibly hungry. They are opportunistic feeders (meaning they eat a wide array of food from whatever source is available), and they are primarily foragers (which means they travel to look for plant food as opposed to hunting or lying in wait for prey). 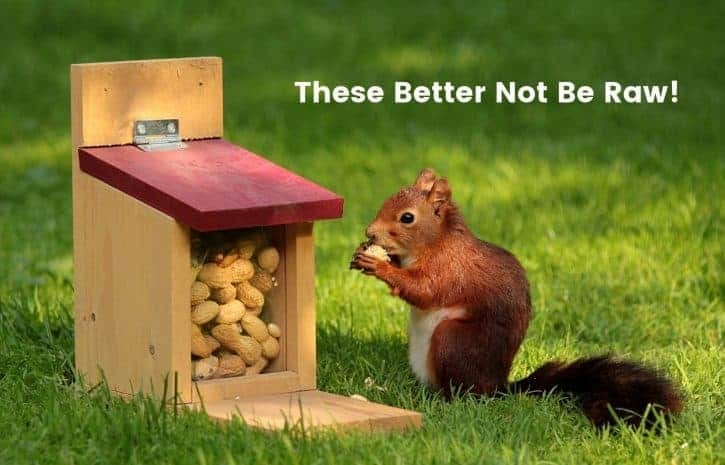 Squirrels are not picky at all and will eat just about anything they can get their paws on! However, because they cannot digest cellulose (the main substance found in plant matter), this means that they cannot survive off just plants. Instead, they rely on a variety of foods that are high in fats, carbohydrates, and protein (like nuts and seeds). Since squirrels have a very diverse palette and can eat all kinds of foods, they will even eat foods that aren’t good for them (such as dairy, chips, candy, and chocolate). Some of the other foods that squirrels will often eat are flowers, tree bark, insects, leaves, grass, and birdseed (as many a bird watcher has witnessed). There are also plenty of mixes available at pet stores that have pre-mixed blends of squirrel food. A popular pet store food for pet squirrels are squirrel blocks which are formulated to have all the nutrition a squirrel needs to prevent Metabolic Bone Disease (MBD). MBD is caused by a calcium deficiency in a squirrel’s diet, and sadly, is common in pet squirrels (and is lethal). Some of the things that can contribute to MBD are improper diet (such as feeding too many nuts) and not enough sunlight (if your squirrel is housed indoors). Symptoms include lethargy, loss of appetite, paralysis, and seizures. There are also calcium and multi-vitamin powders that you can buy to sprinkle on your squirrel’s food. And there are numerous recipes online for how to make squirrel balls, nut balls, or nut squares (which are essentially homemade versions of squirrel blocks). If you are ever in doubt about if your squirrel is getting enough nutrients and feel that they may be getting MBD, please see a specialized veterinarian! How Do Squirrels Get Their Food? As mentioned previously, squirrels are foragers and opportunistic feeders. This means they spend a lot of time searching for available food. Squirrels also practice food caching (also known as hoarding) where they store their food in private locations to hide it from competition. This is often done in warmer months to prepare for winter. Contrary to popular belief, squirrels do not hibernate in winter! They just really don’t like the cold and will often hide in their nest or den. Squirrels also sleep a lot more in the winter and tend to gain weight to help keep them insulated against the cold. Squirrels also practice deceptive caching which is where they dig a hole, pretend to drop in a nut, and then cover it with leaves, but they don’t deposit the nut. This may seem like a lot of effort, but their survival depends upon outsmarting their competition! 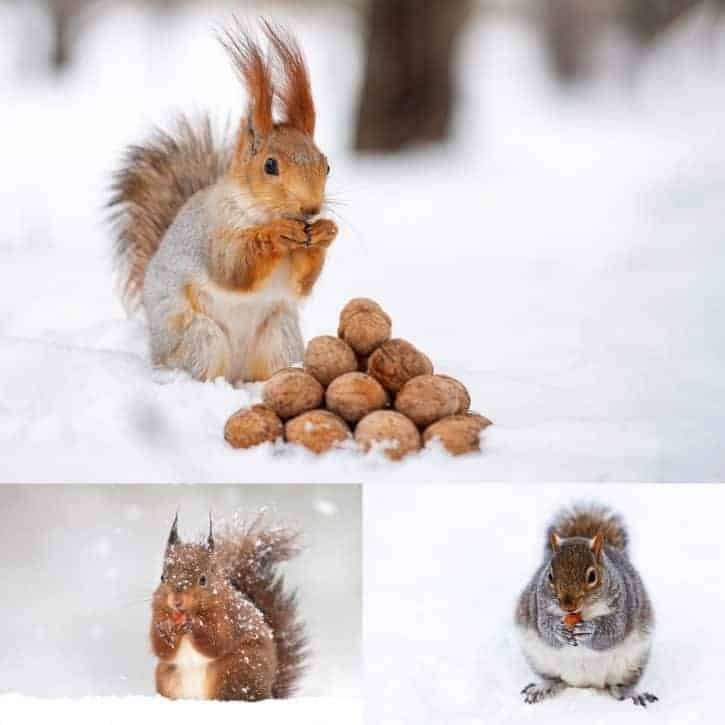 Even though they hoard a lot of food for the winter, squirrels often bury more food than they can later find. While this is great for trees, this is a sad state for squirrels. Surprisingly, the most difficult time squirrels have finding food is in early spring and not in winter. This is because often the food they have buried has started to sprout and grow, but other food has not yet become available to them. On top of that, they are more active than they are in winter, so they require more sustenance. As for how they eat, squirrels are well adapted for their diet with very strong teeth and jaws. Squirrels have 20 teeth in total. They have four incisors (two upper and two lower) that they use to help them crack open hard nut shells and seeds. And they also have 16 molars to help them chew up their food. Fun Fact: Squirrel’s incisors never stop growing and grow on average about six inches a year! Also, while a squirrel with his mouth stuffed with nuts is an iconic image, only ground squirrels have cheek pouches which are pockets that are just behind their front teeth (located between their jaws and cheeks). Tree squirrels and flying squirrels don’t have cheek pouches. What Do Baby Squirrels (Kits) Eat? Baby squirrels are called kits or kittens and have a slightly different diet than adult squirrels do. Since they are mammals, when they are born, they survive off their mother’s milk. After about six weeks they begin to be weaned off milk and start eating solid food. In the wild, they start off eating fruits, vegetables, and unshelled nuts. As pets, they are often introduced to squirrel blocks first to ensure that they are getting all their nutrients and gaining weight. Since baby squirrels are not common pets, a more common encounter is when humans find baby squirrels that have fallen out of nests. It’s important to note that just because there is a baby squirrel on the ground does not mean it’s abandoned. The mother could be rebuilding her nest, moving other babies, or hesitant to grab the baby because of your presence. If you feel a baby squirrel is abandoned, it is important to keep it warm (baby squirrels cannot generate their own body heat). Baby squirrels also will not eat if they are not warm, and mother squirrels will not take back a baby squirrel that is cold to the touch (they think the baby is sick). Mama squirrels are not deterred by the scent of humans on their babies. If you feel a baby squirrel is abandoned, place it in a box with a warm water bottle or heating pad (the temperature should be about 99˚F). Once the baby has warmed up, it should start calling for its mother (this may entice the mama squirrel to come back for her baby). If the mother still has not claimed her baby after a while, then they may truly be orphaned. Baby squirrels can be fed Pedialyte, Esbilac, or a homemade solution of one teaspoon salt, three teaspoons of sugar, and one-quarter warm water. Always use oral syringes (that don’t have needles), and always feed them upright so that they don’t get fluid in their lungs. Never feed baby squirrels cow’s milk, goat’s milk, or soy milk. These are deadly to baby squirrels! Your best bet is to contact a rehabilitation/refuge/rescue center that takes squirrels or a specialized veterinarian to help ensure that the baby squirrel has the best chance for survival. Fun Fact: Baby squirrels are born blind and without teeth or hair. What Do Adult Squirrels Eat? 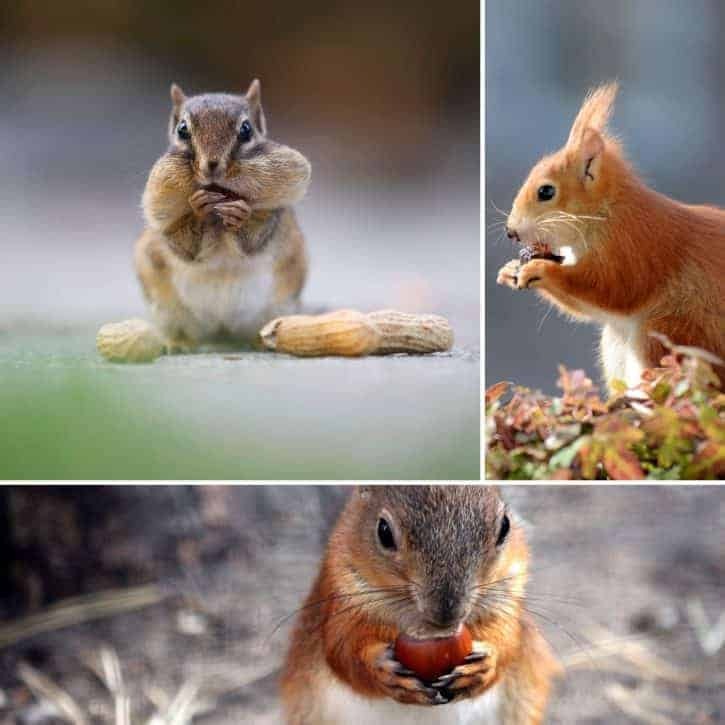 Adult squirrels will eat just about anything, but they primarily eat nuts, seeds, fruits, fungi, vegetables, grains, and plants (with a heavy emphasis on nuts and seeds). They also will eat twigs, tree bark, grass, and leaves in the winter when food is scarce (since they are higher in cellulose, these are less preferred during normal food months). They also eat meat when there are not a lot of other options. In the wild, they commonly forage for nuts and seeds, but as pets, they are typically fed bags of pre-mixed foods and squirrel blocks to make sure they are getting adequate nutrition. However, there are some foods that they shouldn’t eat such as dairy, chips, candy, and chocolate. Also, raw peanuts are bad for squirrels because they may have a fungus that is harmful to them. Always make sure to feed squirrels roasted peanuts instead (and unsalted because salt is also bad for them). Raw corn is also not suggested for squirrels. Even though corn often comes in pre-mixed bags of food, raw corn may potentially also carry a fungus that is harmful to squirrels (and it is low in nutritional value). Additionally, while not bad for them, squirrels strongly dislike raw onions, raw garlic, and any type of hot pepper. Therefore, people will often spray pepper spray or place raw onions and garlic near their gardens and bird feeders to try and dissuade squirrels. The key for keeping an adult squirrel healthy is the same as with any diet: a wide variety of healthy foods and limited treats and sugars. Squirrels are diurnal (active during the day) and should be fed during daylight hours except for flying squirrels which are nocturnal (active at night). For wild squirrels, you can just place food outside in a squirrel or bird feeder, and they can eat it at their leisure. For pet squirrels, it’s best to follow the instructions on your bag of food and supplement with outside food throughout the day. Fun Fact: Squirrels can eat up to their own body weight in food weekly. Imagine if humans ate like that! However, a common issue with pet squirrels is obesity. Since pet squirrels don’t have to forage, they are less active. On top of that, they are getting highly concentrated food and treats that they normally wouldn’t have access to daily. Never overfeed your pet squirrel, and try to limit salt, sugars, and fats (some seeds are especially high in fats). You should also supply your squirrel with fresh water daily. Squirrels are omnivores (meaning they eat both plants and meat). However, they primarily eat plants. They are opportunistic feeders (meaning they eat food from whatever source is available), and they are primarily foragers (which means they travel to look for plant food). Baby squirrels (called kits or kittens) start off with their mother’s milk, and after around six weeks they begin to progress to solid food. In the wild, baby squirrels start off eating fruits, vegetables, and unshelled-nuts. As pets, they are often introduced to squirrel blocks first to ensure that they are getting all their nutrients and gaining weight (and to help prevent Metabolic Bone Disease). 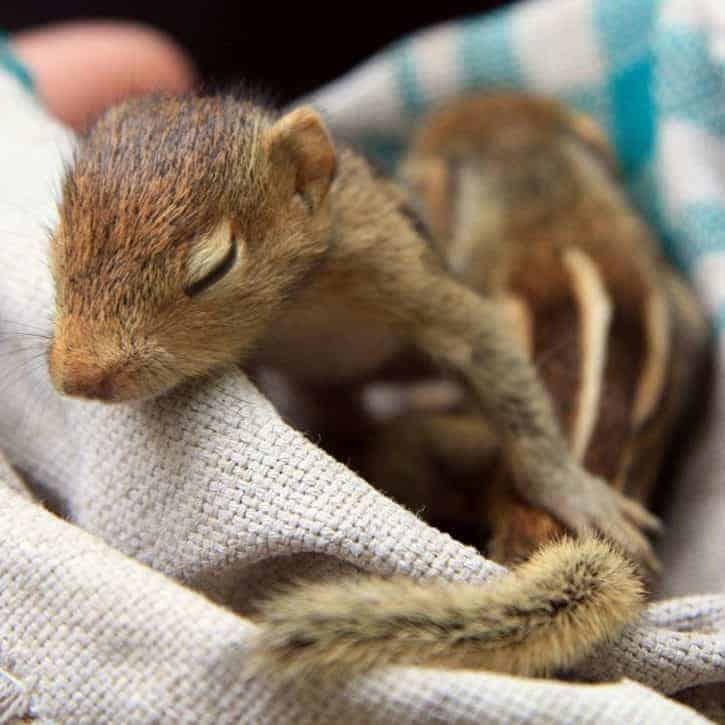 If you ever find an abandoned baby squirrel its important to keep it warm, otherwise it will not eat, and you should never feed baby squirrels cow’s milk, goat’s milk, or soy milk. In the wild, adult squirrels commonly forage for nuts and seeds, but as pets, they are typically fed bags of pre-mixed foods and squirrel blocks to make sure they are getting adequate nutrition. However, squirrels should not eat dairy, chips, candy, chocolate, raw peanuts, or raw corn. They also dislike raw onions, raw garlic, and hot peppers of any kind. 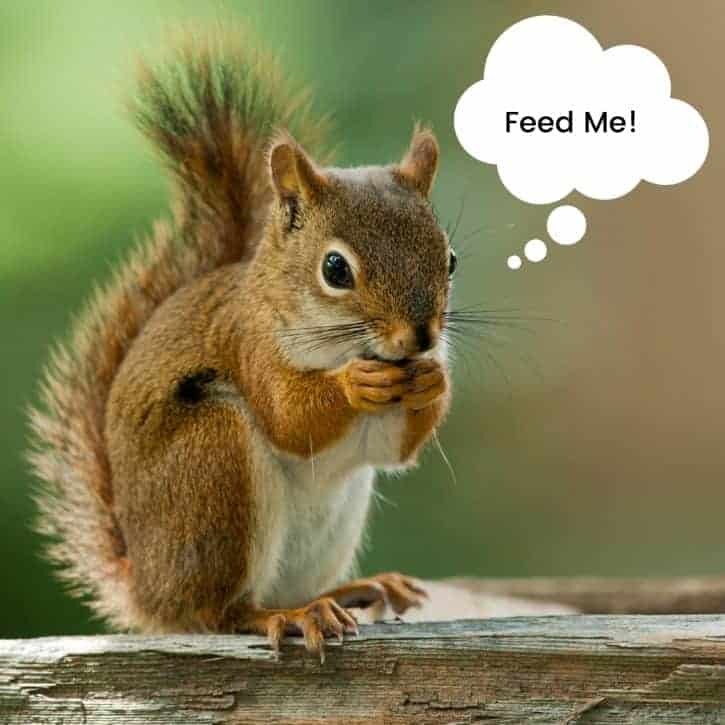 Squirrels should be fed during the day because they are diurnal (active during the day) except for flying squirrels which are nocturnal (active at night). Also, it’s important not to overfeed squirrels and to try to limit salt, sugars, and fats (and always supply fresh water daily).